It is crucial for children of migrant background in Europe to become proficient in their host country's main language of instruction. Lack of proficiency stands in the way of students' ability to comprehend and follow lessons, which in turn can lead to poor academic performance, lack of interest in education, and even behavioral problems. To avoid such outcomes for migrant children, schools should provide sufficient support for youth to learn and master the language of instruction. Teachers also should receive training to address the linguistic needs of their students in the best way possible. At the same time, schools could support the continued use and study of students' mother tongue, which can both help students learn the host-country language and enrich the educational environment by introducing cultural and linguistic diversity. 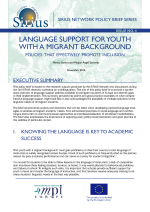 Recent studies have identified a number of tools and approaches that can provide effective language support for migrant children, including adequate initial assessment of language skills, language induction programs that ensure a smooth transition into mainstream classrooms, ongoing language support, training for teachers of all subjects, and valuing students' mother tongue. Despite these suggestions, there is no blueprint for what ideal language support might look like, and many European Union (EU) Member States are facing gaps in implementation of best practices. This MPI Europe policy brief provides key points and good practice examples on what comprehensive language support might look like. It recommends actions and directions that can be taken when developing national language strategies to address immigrant students’ needs, from school-level practices on state-language and mother-tongue instruction to community-based approaches and professionalization of all relevant stakeholders. The brief also emphasizes the importance of adjusting every policy recommendation and good practice to the realities of particular context.